Free Punta Cana weddings are being advertised everywhere these days. There is no such thing! There are some places that offer a very good value for your destination wedding in Punta Cana, but none of them are free. There are several ways that you can get great deals and create memories that will last a lifetime, but you do need to be careful of who you book with. We always suggest All Inclusive Resorts, they have the best mix of prices and great service that you’ll find anywhere. 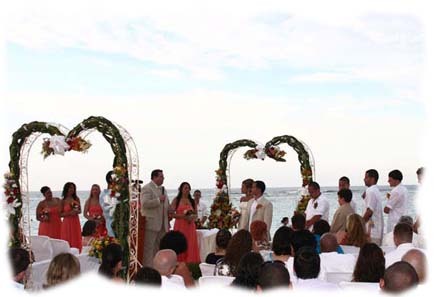 You will also have your entire wedding from planning to vows organized with one real life person. Their rep will be available to you and your guests from the time you book until you get back home. The hotels offering free Punta Cana weddings invariably force the wedding couple or their guests into expensive room upgrades that offset the cost of the wedding. In addition, the “free Punta Cana weddings” only cover the reception part at the resort, the legal fees for the wedding are never included. The legal fees for your destination wedding in Punta Cana can range from $300 - $500 (nearly half the cost of the typical wedding). Rather than looking for free Punta Cana weddings, look for great group rates that allow all your guests to save a little bit. Look for group rates that include bonuses for attaining a certain number of guests. You can often get the 21st client free at the resort, which puts money back in the bride and groom’s pockets to pay for the wedding. If you start off the planning process looking for free Punta Cana weddings, you’re destined to get what you paid for. Find a balance between price and reliability, the service you receive is as important as the price. In the long run going with an honest and upfront outfit like All Inclusive Resorts will save you money.